The stately fireplaces were designed by John Calvin Stevens and added to the 1760s farmhouse during an earlytwentieth- century renovation. 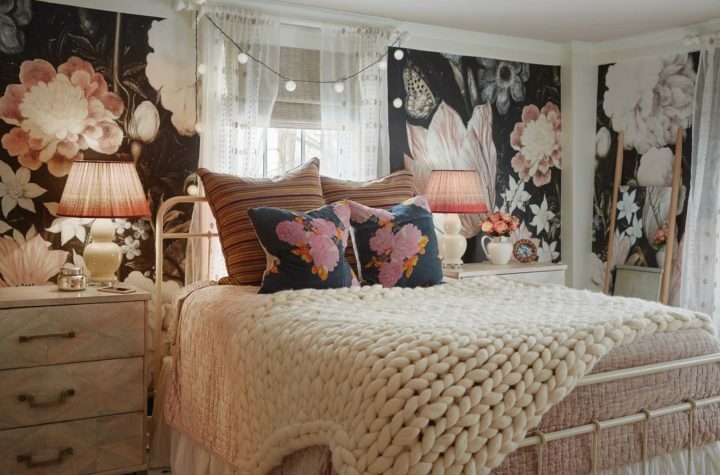 Manganello designed her daughter’s room to feel both feminine and classic. 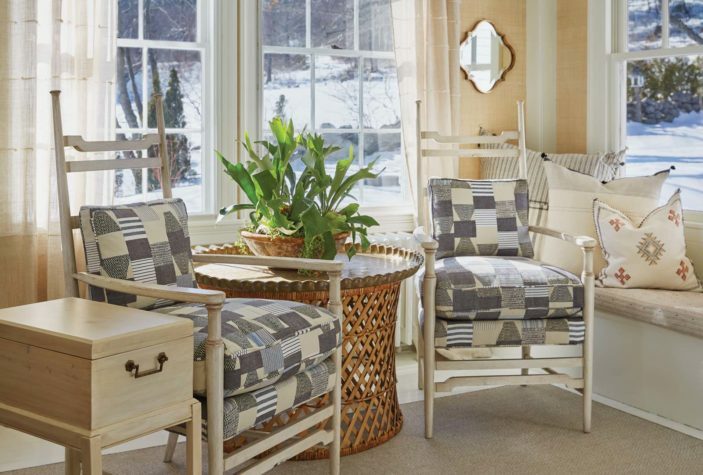 As an interior designer, Manganello has a lot of experience reupholstering furniture. Many of her pieces are vintage finds that have been covered with modern fabrics. She likes to shop the Brimfield Antique Show in Massachusetts, searching for unique pieces she can strip down and paint. Through the sitting area, a glimpse of the dining table. The Chilton cherry table measures 14 feet long. Manganello uses it to host big holiday dinners for her extended family. The kitchen is the heart of the house. 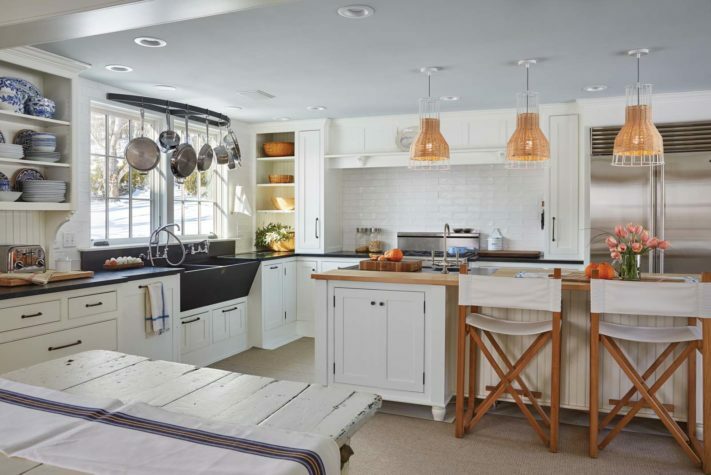 The big soapstone sink is a centerpiece to Manganello’s workstation. A collection of vintage and new blue-and-white chinaware is displayed on the shelves. “I like to mix and match,” she says. 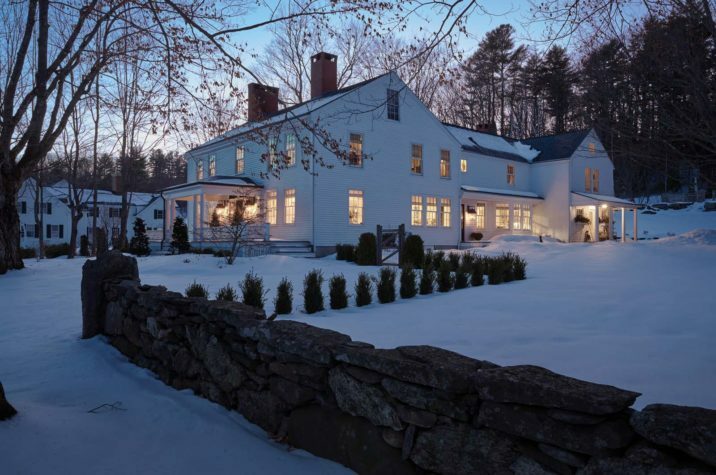 Manganello’s farmhouse is located just a short distance from her office. Shortly after purchasing the house, Manganello removed the cabinet doors and stripped them down to the pine. She likes the Scandinavian modern look of bare blonde wood. Manganello’s upholstered bed is by Hickory Chair. Grass cloth covers the walls and adds texture. In the front living room, a sitting chair is placed next to a rattan side table, accompanied with a lamp by Arteriors. 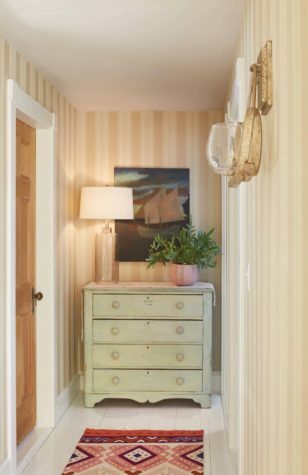 A little vignette of items in the upstairs hallway. Sometimes, you just have to knock down a few walls. 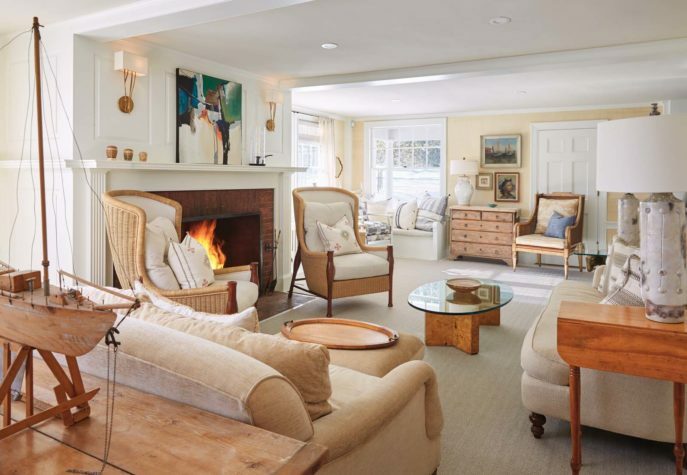 When Nicola Manganello bought her sprawling 1760s farmhouse in Yarmouth, she knew she would have to open it up a bit to create some extra space for her family and friends. It’s a gorgeous, stately home, complete with oversize brick fire-boxes designed by New England architect John Calvin Stevens. 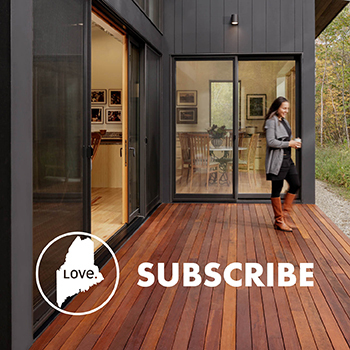 Some people might blanch at the idea of updating a house like this, but Manganello knows what she’s doing. 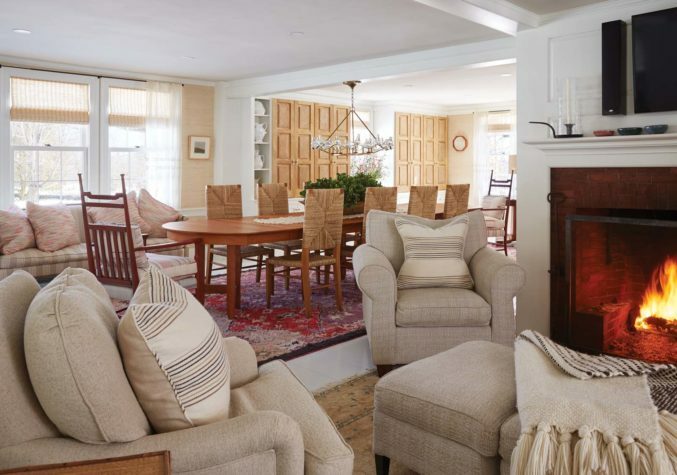 She’s been in the interior design business for decades, and she’s been a DIY enthusiast for even longer. She inherited this tendency from her father; from her mother, she learned the value of having a steadfast sense of taste, an adherence to elegance. Founder of Nicola’s Home, a design-build firm located just steps away from her house on a shady road by the sea, Manganello has well-earned confidence. So the decision to disrupt the floor plan of the historic structure wasn’t a difficult one. See, she needed a room that would fit her husband’s beloved dining table. 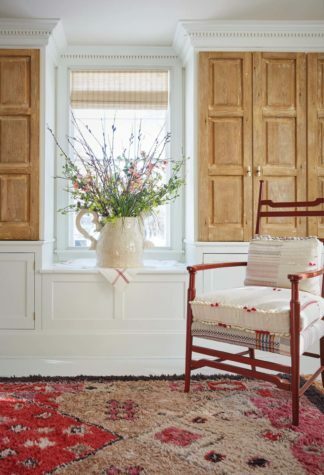 While her mother prefers tried-and-true New England designs—think toile prints and primary colors—Manganello is a bit more inspired by Scandinavian design, with its emphasis on texture and coziness and preference for simple, soft color palettes. Her house is filled with pastels: light pink and baby blue, soft yellows and creamy beige. She’s similarly attached to her collection of artwork, which the couple built slowly, adding a piece here, another there. There’s a painting by Connecticut artist Alison Meyer hanging in her sleek kitchen. It shows a vivid green bottle of gin set against a slate blue background. (“I bought that as a gift for my husband, since he loves Tanqueray,” she explains.) In her sitting room, there’s an oil painting of women in green and red dresses, sitting on a lawn, laughing and drinking. “That’s me and my two dear friends, Melanie and Tara,” Manganello says. “My friend Tessa O’Brien painted it. I had a garden party one night, and we were sitting out in the yard at a tea table, but we weren’t drinking tea.” She smiles at the memory. But, while some of her paintings and prints come from friends, others are of unknown provenance, purchased at flea markets and antique sales. “Some of it goes all the way back to my years at Maine College of Art,” she tells me as we walk upstairs, our footsteps quiet on the carpet. “My friends would be throwing their pieces away at the end of the semester. In the back room, there’s a painting like that, a little house in a field.” On the other side of the canvas, there’s another piece, hidden from view. “In school, you always use both sides of the canvas,” she adds. 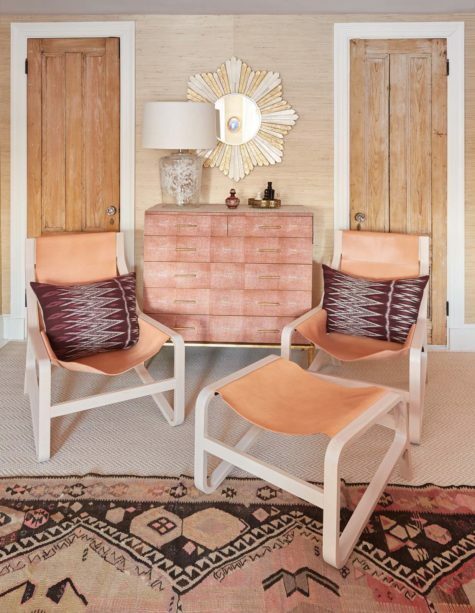 Inside Nicola Magnello's home in Yarmouth, the defining hue is a blushy pink. 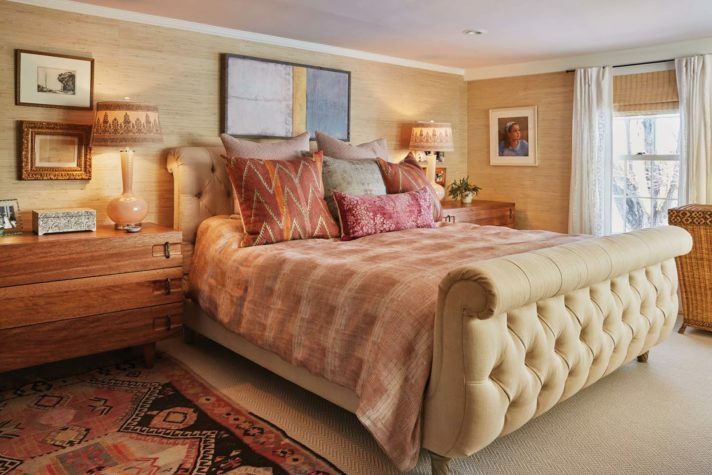 Manganello added grasscloth wallpaper throughout the house to give it a cohesive feel and to add texture to the rooms. 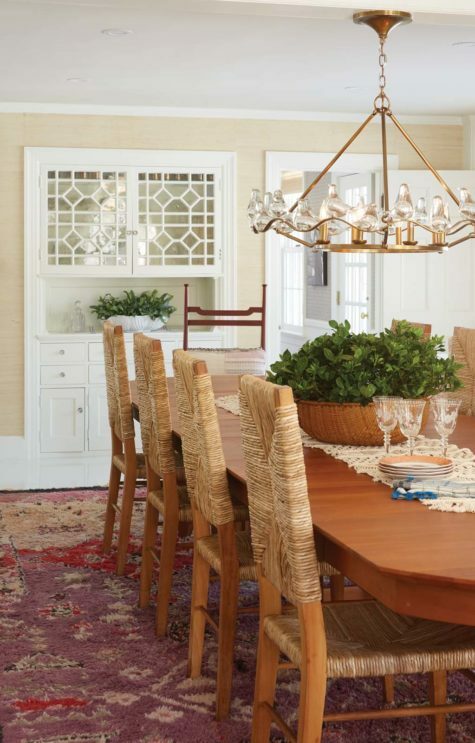 When Manganello and her husband, Jim, moved into this house, they brought their brass chandelier, which features hollow glass birds that can be removed and cleaned in the dishwasher. The table runner is from Anthropologie. 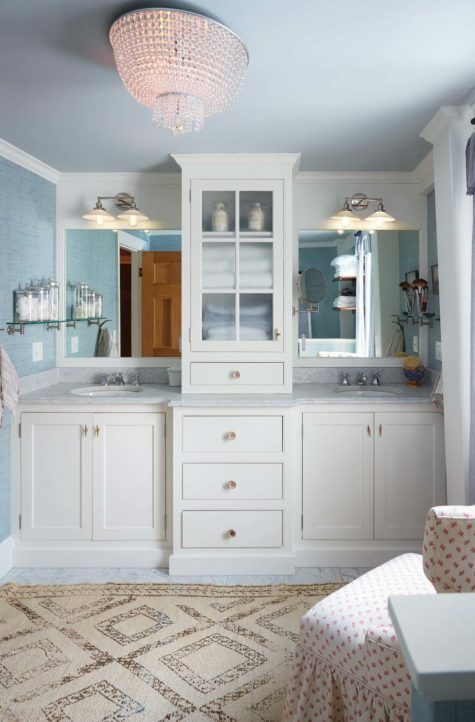 The owner’s suite bathroom features a glimmering crystal chandelier by Visual Comfort and ice-blue paint on the ceiling. The rug is a Brimfield find.